Comic-Con is the apt milieu for the opening moments of Paul, a sci-fi movie mash-up that succeeds in tickling the inner geek of moviegoers weaned on the likes of Star Wars, Alien, and the Steven Spielberg canon. Indeed, the director himself briefly appears (well, his voice) during a telephone conversation with the titular space alien, voiced by Seth Rogan, seeking creative counsel during the pre-production of E.T. That scene is itself a goof, because while the bulk of its dialogue is drawn from the aforementioned genre touchstones plus Back to the Future, Star Trek, and many more, Paul itself is essentially an E.T. pastiche about an alien who has phoned home and now needs the help of strangers to catch its ride. Enter middling science-fiction writer Clive Gollings (Nick Frost) and his best bud Graeme Willy (Simon Pegg), Londoners who hopped the pond to attend San Diego's Comic-Con before striking out in a rented RV for a road trip along the Extraterrestrial Highway. Meeting Paul puts them face-to-face with the object of their sci-fi dreams. 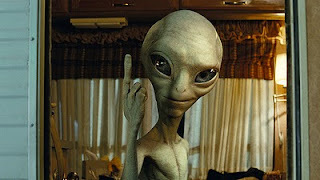 Ironically, the wise-cracking, foul-mouthed, pot-smoking alien also embodies the proverbial ugly American. During his decades of governmental interment, Paul – who resembles the clichéd little green Martian – served as a popular-culture prototype, a technical advisor for the entertainment industry. Dovetailing off this premise, it’s intriguing to postulate whether Paul also inspired Hollywood’s typical comedic stoner, instead of vice versa (see, for e.g., Rogan’s own Pineapple Express). The misfits finds themselves pursued by governmental Men in Black, including Jason Bateman as agent Lorenzo Zoil (pun-alert, one of many), and a faceless Big Guy who serves no purpose other than a device for an eventual Sigourney Weaver cameo (not a spoiler if you’ve seen TV commercials for the film). They also encounter a mélange of Middle America archetypes that assume a freak-show quality – it’s meant as more than parody when we hear the house band at a dive bar playing a hillbilly version of the Cantina Song from Star Wars. Among them are Ruth Buggs (Kristen Wiig), a God-fearing, cycloptic Creationist who eyes are opened, literally and figuratively, once Paul mind-melds with her. Wiig fits in nicely with Pegg and Frost’s distinctive gonzo byplay, although the script’s Christian targeting crosses the line into mean-spiritedness. Moreover, while there is much comic value in a well-placed F-word, the glut of profanity deployed by Superbad director Greg Mottola not only grows wearisome, but it is also conspicuously used to patch holes in a sometimes aimless plotline. Indeed, although Pegg and Frost wrote this screenplay, things don’t feel quite right without Edgar Wright, their longtime partner-in-sublime. The change in director and locale dulls the razor-sharp Brit wit that cut through the trio’s work in Spaced and, more notably, Shaun of the Dead and Hot Fuzz, two parodies that doubled as durable genre entrées. Paul, on the other hand, feels like one long game of Name that Reference. It’s fun for fans and fan-boys alike to play along – just don’t expect much of a prize at the end.